​Enfield Performing Arts Center ("The Lodge") Renovation and Restoration Project is a collaborative venture to renovate the 91-year-old 40,000 square-foot Enfield Masonic Lodge; to create an aesthetically pleasing and historically significant facility to meet the needs of local artists for performance arts space; to alleviate the financial burden imposed on these artists by for-profit, union, private-sector rental halls; and to provide access for all citizens to the community’s best performing artists. The theater holds significant economic, cultural, and social promise for the Enfield and greater Halifax County communities; promotes optimum utilization of local resources and talents; and will draw back to Enfield and Halifax County local residents and businesspersons who have fled to larger urban areas for greater business and social opportunities. § Replace with historically accurate materials, finishes, signage, lighting, etc. § Inspect and replace or restore light fixtures, signage, handrails, doors, windows, etc. More specifically, The Lodge Theater’s renovation includes maintenance to the roof, exterior walls, fire alarm system upgrades, electrical wiring, egress and ADA-accessibility construction requirements, performance stage extensions, and construction to permit use of dressing rooms. These repairs will address directly the decisive threats to the theater’s structure by antiquated wiring, water infiltration and the lack of suitable life-safety mechanisms. A new fire sprinkler system will be installed with piping, valve riser system, alarm actuation and addressing system that will adhere to code requirements (strobes, horns and pull stations.) Furthermore, an accessible wheelchair lift will be installed to allow stage access during special events. Mechanical, electrical, and plumbing repairs will address life-safety mechanisms and the installation of new toilet fixtures, light fixtures, power receptacles, and air control devices (registers and louvers). Carpentry, drywall, acoustical ceiling repair, and replication of historical doors are among the theater’s renovation and preservation tasks to be completed. New carpeting will be laid on the dressing room access stairs, dressing rooms, interior lobby space and concession space. Renovation and restoration repairs also target the existing historic ceramic tiles at the outer lobby space and the bathrooms. These tiles will require significant patching and cleaning. Additionally, plaster ceiling areas at the outer lobby and the major auditorium space will be painted to encapsulate asbestos containing material and will be colored to match the theater’s historic coloring. 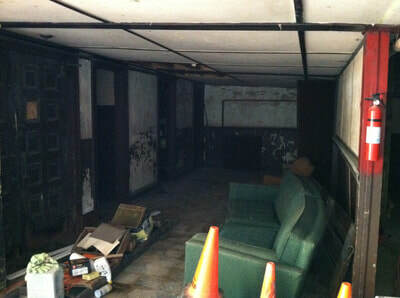 The exposed portions of the historic interiors will be painted with colors to match the original. The theater’s seating will undergo full refurbishment and rigging/dimming systems will be installed for the stage. These systems include light, drapes, scenery drops, piping systems and hangers necessary to equip the stage with the dead hung gear to ready it for performances. Amps, mics, speakers and wiring required for adequate acoustics will also be purchased and installed. Provide Community and Cultural Access. The Lodge Theater will address directly the tremendous need for performance space and a low-cost cultural and arts facility in Enfield. Provide Commercial Rental Space. The theater will be available to corporate and convention groups for commercial rentals. These rentals will generate revenue and keep the rates for non-profit rentals low. Additionally, the theater will be available to community arts groups, merchants, and sponsors to hold special events and festivals for both the arts community and the surrounding residential districts. Promote Enfield and Halifax County Area Revitalization, Redevelopment and Renewal. The Lodge Theater will help to define the shape and strategy of revitalization along the Roanoke Valley and Tar Pimlico Basin, lend stability and character to the community and promote steady activity. Produce a Significant and Positive Economic Impact. The theater will serve as a critical catalyst for the creation of new businesses, new jobs, and increased tourism and foot traffic. Simultaneously, these benefits will generate a significant and positive impact in Enfield and the greater Halifax County community. In fact, according to a study conducted by Deloitte & Touche in April 2003, for every $1 invested in the arts and cultural organizations, $34 in economic activity is generated. 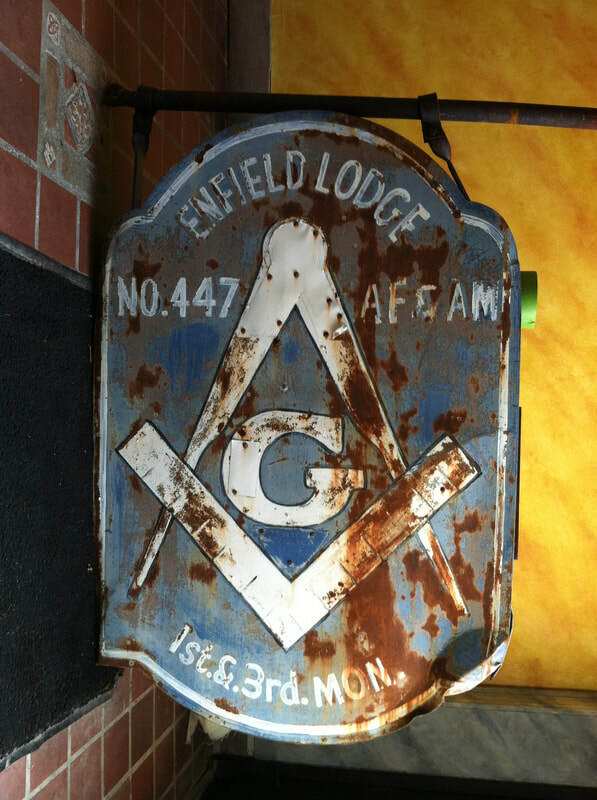 Serve as a Historical Draw to Enfield. 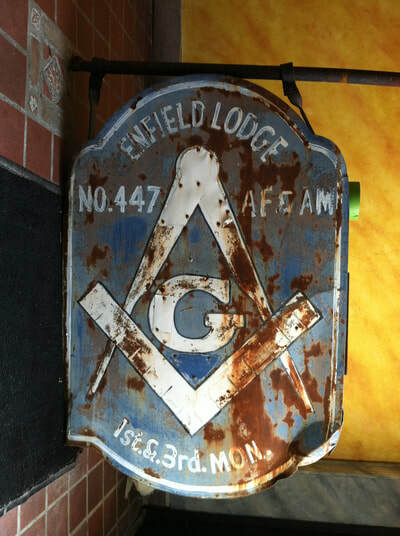 The Lodge is developing a historical display of the activities surrounding the history and legacy of Enfield and Halifax County on the establishment of the United States and a citywide tour pinpointing the sites associated with our storied history. Preserve a Local and National Historic Structure. 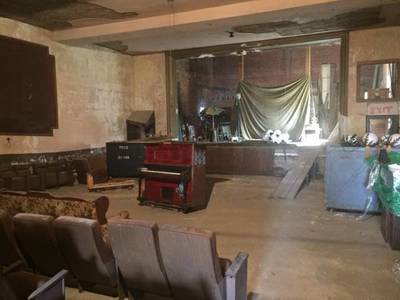 Preserving the Lodge Theater will save an internationally recognized structure that is impossible to replace once destroyed. The Lodge Theater possesses special historic, cultural and architectural significance that enhances our residents’ quality of life, embodies features of our unique heritage and represents lessons learned. Counter Blight. The theater’s restoration remedies the negative effects of the blighted structure and urban decline on neighboring properties. As such, the theater’s renovation removes critical impediments to private investments. Sponsor us through the theater seat program!! Reserve your special seat today! do you have or know anyone that has any theater materials or construction items listed above? An In Kind donation of any materials would be greatly appreciated. Items such as wiring, lighting, sound, hardware, HVAC, seats and more. All greatly appreciated and welcome. Or do you have construction talents that you have the time to donate labor hours? Please contact us today to ask how and when to help. Thank you thank you thank you!! !